Les Borres Cave site is a rock-shelter, located in the head of Siurana river basin, which origin is related to a karstic landscape originated during the collapse of thick limestone cliff dated as Triassic. Actually, the site is a big rock-shelter originated by the collapse of a previous phreatic cave due to slope and fluvial incision processes. The Siurana river down cutting creates a thick cliff where slope processes formed an undated talus cone. In the upper surface of this talus cone a pedogeneised (redzina-like to mollic horizon-like) limestone breccias conforms a late upper Pleistocene-early Holocene sedimentary succession. The Borres Cave site reaches ca. 40 meters width with a preliminary thickness of 1.5 meters. The maximum thickness of the talus cone reaches 20 meters showing typical sediments of glacial stages in the Mediterranean area (grèzes litées) Pleistocene aged. These sediments has not been explored yet, and their archaeological potential is actually unknown. The site was discovered by Dr. Salvador Vilaseca and his collaborators (Albert Prunera and Manuel Mata) during the 40's of the XXth century. 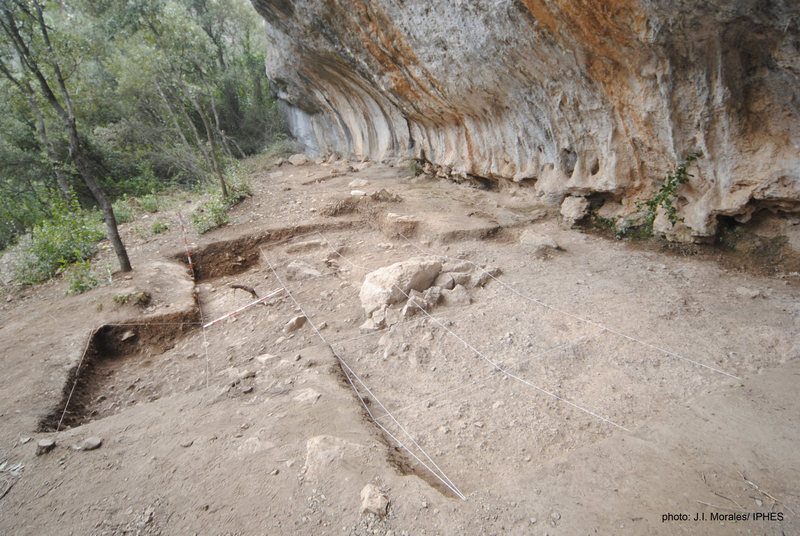 Dr. Vilaseca published the archaeological remains recovered as the earliest record of human presence in the Prades Range. Fieldworks restarted in 2012. The preliminary studies of the archaeological assemblage as well as the 14C dates suggest a Late Magdalenian and early Epipaleolithic record. Technological assemblages shows a predominance of laminar debitage and the configuration of backed points and blades and endscrapers. The zooarchaeological studies shows a systematical processing and burning of mountain taxa like Capra and Cervidae.